Rory Fitzgerald, Director of the European Social Survey and Senior Research Fellow at City University London, delivered an engaging workshop on the challenges of cross-national surveys using the example of the European Social Survey (ESS). Mihaylo Milovanovitch, Network Fellow at the Edmond J. Safra Center for Ethics, gave a memorable presentation on a method for measuring ethics in the Armenian education system. The research linked corruption with educational outcomes in Armenia. Alexi Gugushvili, an Academic Swiss Caucasus Net (ASCN) Research Fellow in South Caucasus Studies at the Russian and Eurasian Studies Centre of the St Antony’s College, University of Oxford, delivered the final keynote speech, Money Can’t Buy Me Love: Foreign Land Ownership Regime and Attitudes in Georgia. In the speech, Alexi argued that the land ownership debates of recent years in Georgia arise from “the confluence of factors such as the communist legacy, historical memory, rural nationalism, agricultural underdevelopment and inequality”. For more information, the full program and some of the papers presented at the conference can be accessed here. The development of local think tanks in Azerbaijan has taken a different route to that followed by most other post-Soviet states and Eastern European countries. In the Eastern Bloc countries, research institutes modeled on Western think tanks became increasingly popular following the collapse of the Soviet Union. However, in Azerbaijan this did not happen, largely due to domestic political developments in the early 1990s. On July 18, 2015 thousands of Georgians gathered in Tbilisi protesting Russia’s “creeping occupation” as South Ossetia based Russian troops continue to draw the border along the Administrative Border Line between Georgia and the occupied territory of South Ossetia. The unresolved territorial conflicts over South Ossetia, Abkhazia, and Nagorno-Karabakh are major sources of instability in the South Caucasus. What do CB interviewers’ ratings of respondents’ intelligence tell us? CRRC’s Caucasus Barometer (CB) surveys regularly collect information about how the interviewers assess each of the conducted interviews – so called paradata that provides additional insight into the conditions surrounding the interviews (e.g., whether someone besides the respondent and the interviewer was present during the face-to-face interview), as well as interviewers’ subjective assessments of, for example, level of sincerity of the respondents. Citizenship is a difficult concept to define as its definition changes over time, depending on social, legal, and political contexts. Importantly, it not only encompasses structural (legal and institutional) aspects, but also the everyday practices through which people relate to the state and other citizens. This blog post examines some of the perceptions as to what makes a good citizen across the South Caucasus and the extent to which people’s actions match up with their stated opinions on good citizenship. Trust in institutions is a widely studied subject in the social sciences – typing 'trust in institutions' into Google Scholar yields roughly 2.5 million results. It is generally believed to have multi-directional relationships with different aspects of social life, with high levels of trust associated with positive phenomena – acceptance of innovation and a good business environment just to name two. This blog post explored the attitudes of Azerbaijanis towards gender roles, and whether these have changed over time. It showed that there is a cross-generational continuum in the defined gendered character of the activities children and teenagers have been taught to perform. This blog post looks into how the attitudes of the representatives of various socio-demographic groups differ towards these two statements, which are jointly referred to as “violence against women”. This blog post is based on research on (dis)trust in political institutions in Azerbaijan. Internationally, levels of trust in political institutions often reflect how well these institutions perform in relation to citizens’ expectations. May 31st is World No Tobacco Day as declared by the United Nations. According to the World Health Organization (WHO), tobacco usage is the primary reason for chronic diseases including “cancer, lung diseases, cardiovascular diseases” among other diseases. In the Principles and Recommendations for a Vital Statistics System, Revision 2 (by the United Nations), divorce is defined as “a final legal dissolution of a marriage, that is, that separation of husband and wife which confers on the parties the right to remarriage under civil, religious and/or other provisions, according to the laws of each country.” This blog post examines divorce in Azerbaijan over the years, by age group, gender and by duration of marriage. The post also explores perceptions of happiness among divorced Azerbaijanis and those who are not divorced. 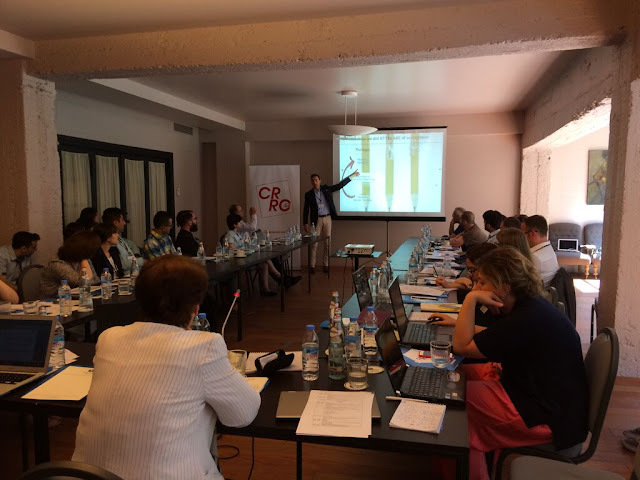 The second annual CRRC methodological conference took place on the 25th of June at Tbilisi State University. With over fifty attendees and a packed program of presentations, the conference drew together policy practitioners and researchers from the South Caucasus and beyond. On February 3rd, 2014, Facebook celebrated its 10th anniversary. According to the World Map of Social Networks December, 2013 statistics, Facebook is the world’s most popular social network with more than one billion users. It is followed by QZone with 552 million users, Vkontakte (190 million users), Odnoklassniki (45 million users), and Cloob (1 million users). However, it is important to note that social network usage is not distributed evenly geographically. When is a war not a war? When is a war not a war? While it may seem commonsensical that a country cannot simultaneously be at war and at peace, the prevalence of several ‘frozen conflicts’ in the post-Soviet space defies simple categorization. If we take the conflict between Georgia and Abkhazia or South Ossetia as an example, a quick internet search shows that there was a five-day war in 2008 that ended on the 12th of August with a preliminary ceasefire agreement. On 1 April, 2014 the International School of Economics at Tbilisi State University (ISET) published a blog which described a future Transcaucasian Confederation agreement signed by the three South Caucasian states. Despite the fact that the blog was an April Fool’s Day joke, it provoked significant interest and reader response. The three countries of the South Caucasus (Armenia, Azerbaijan and Georgia) are geographically, historically and politically bound closely together. Nevertheless, these countries often find themselves in disagreement when faced with broader geopolitical questions regarding alliances, threats and visions about the future of the region. State capacity in the South Caucasus: How do you measure how much the state can do? So far, in this series think tankers working in the South Caucasus have reflected on the issues challenging their countries’ think tank sector. In many ways, some fundamental problems lie at the heart of the specific problems, and I think they can more or less be summed up as problems with language and audience; quality of research; funding; and transparency. This post takes a look at one of these challenges – language and audience – and considers some things that might nudge the region’s think tanks forward. Brookings Event - Internally Displaced Persons and Host Communities: The Limits of Hospitality? Most of the world's 27 million people who have been internally displaced by conflict do not live in camps; rather they live with family members or friends or are dispersed within communities. One frequently overlooked aspect of displacement is the impact of internally displaced persons (IDPs) on the communities which host them—communities which are often poor and marginalized themselves. Third Stage of the Junior Research Fellowship Program at CRRC-Azerbaijan Launched! In February 11, 2011, the CRRC-Azerbaijan office launched the third stage of its Junior Research Fellowship Program, funded by the Open Society Institute Think-Tank Fund. Fifteen selected participants will attend the next round of extensive trainings that will prepare them for writing public policy papers. CRRC is happy to announce its new Online Data Analysis (ODA) program! Crunching numbers from CRRC surveys is now easier than ever. 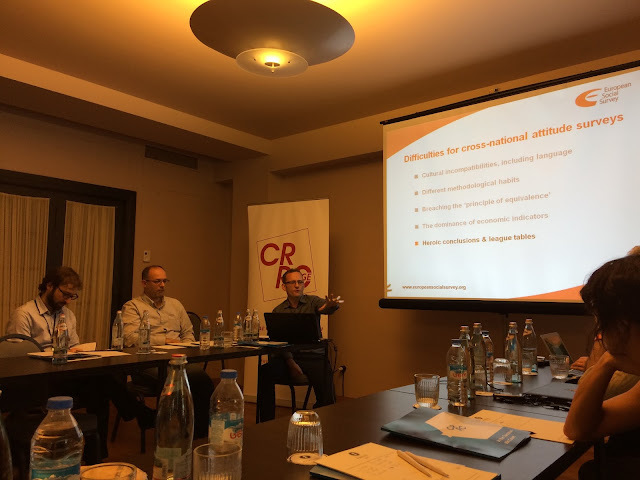 CRRC recently completed its 8th annual Caucasus Barometer survey, gathering data about perceptions of trust, livelihood and social realities during face-to-face interviews in Armenia, Azerbaijan and Georgia. Some of the results from these countries have been compared to results from 22 other countries that were surveyed as part of the 2010 Pew Global Attitudes Project Survey. Despite some international criticism on media freedom, nationwide survey data shows that Azerbaijanis seem to be generally satisfied with certain forms of national mass media—although with a few exceptions. The overall picture that emerges from the 2011 Caucasus Barometer in Azerbaijan is that 44% of the population thinks TV journalists inform the population well, 32% are neutral, and 16% say TV journalists do not inform the population well (7% don’t know). Fancy Living Abroad? 39% of Young Armenians Say "Preferably Forever"
Last year, Ani Navasardyan asked, “Why do so many Armenians leave Armenia?” Migration is also an issue in Georgia and Azerbaijan. Data from the CB 2010 reveals that around half of the respondents in Georgia (47%) and Azerbaijan (52%) are interested in temporary migration. Still, Armenia stands out since 64% of the adult population is open to the idea of temporarily leaving the country. Women in Parliament: How Do Georgia, Armenia and Azerbaijan Compare to Other Countries? Expanding on the topic of a previous blog, this post compares statistics on the number of women in national parliaments in the South Caucasus and other areas of the world. The countries of the South Caucasus rank low on women’s participation in parliament compared to many other countries. The CRRC’s annual Data Initiative Survey will be renamed into the Caucasus Barometer starting from 2010. At CRRC, we think that the new name better reflects the essence of the survey and is more understandable for the general public and the journalists. Looking at the recent data from the Global Attitudes Project of the Pew Research Center, we came across a curious survey item. Who do people across the world think will win the World Cup? Following an article on Georgians’ attitudes toward Russia, CRRC Fellows Therese Svensson and Julia Hon have written a new piece for CAD, entitled “Attitudes toward the West in the South Caucasus”. Their article looks at citizens’ views on three areas of relations — political, economic and cultural — between the South Caucasus and the West, in particular NATO, the US and the EU. The data were derived from the South Caucasus–wide 2007 and 2008 Data Initiatives (DI), as well as from the 2009 EU survey that was conducted in Georgia. A particularly intriguing talk at TEDxYerevan was given by Tim Straight, Honorary Consul of Norway and Finland to Armenia. Is the Caucasus in Europe or in Asia? Tim highlighted that there are five countries that defy easy categorization: Russia, Armenia, Azerbaijan, Georgia, and also Turkey. Tim explores how the dividing lines fall according to corporations, mapmakers and values. Close friends are an important part of life, whether we are starting a new school year as a child, a new job, or in the context of a stable and familiar environment. Whatever the backdrop, close friends help provide a social safety net where individuals can feel understood and protected against perceived obstacles and hardships. In short, friends are an important part of a sense of well-being and belonging, which affects attitudes across a wide spectrum of issues. Here are some photos from the award ceremony of the first stage of the Junior Research Fellowship Program – Azerbaijan (JRFP) that was organized in a cozy Baku restaurant. The winners of the competition for the best policy essay were awarded iPods, and other participants who had submitted essays received book vouchers. Policy Attitudes towards Women in Azerbaijan: Is Equality Part of the Agenda? The paper published in the 21st edition of the Caucasus Analytical Digest presents an account of how two competing policy approaches coexist in the policy attitudes towards women in Azerbaijan. Readers may recall that we voiced some concern with regards to exit polls. Here is a fascinating account, first-hand, by a reputed pollster having what they describe as an "Adventure in Baku". Cuil for the Caucasus? A quick test! As many of you may have heard, this week saw the launch of a competitor to Google. Cuil, which apparently is an old Irish word for knowledge, has been set up by several former Googlists and promises a search that's more oriented on content, and says it can do a more comprehensive job in the ever-expanding worldwide web. Surveying Corruption | Details Matter! Corruption remains an endemic feature in the region, outside Georgia. No wonder, then, that it continues to receive considerable attention from organizations and donors. Currently, we are being asked to run a survey (we will publish details on that later). How do you do this? Not all of this research is intuitive. Here are a couple of examples of what can go wrong, taken from the draft questionnaire we were given. How do urban Russians view the conflicts in South Ossetia and Abkhazia? From September, 5th-8th, 2008 the Analytical Center of Yuri Levada conducted a survey in ten big cities of the Russian Federation, interviewing 1000 Russian respondents. We have translated the results into English here, as they are only available in the original Russian on the Levada website. Interested in urban development? Want to know how outsiders describe the urban experience of Baku? Two young researchers from Germany have set up a blog to follow their project in tracking changes in Baku. Oriana Kraemer and Sebastian Burger take photographs, attend lectures, and comment on what they observe. Given the inflow of sudden wealth, Baku witnesses comprehensive change. A great project, therefore. The IMF has recently published its analysis of the developments in non-oil tax policy, administration and revenues in Azerbaijan. Non-oil tax policy could be an important tool in stimulating the development of non-oil sectors of the country’s economy. PISA Test | how are Azerbaijani schools doing? OECD has just published their 2006 PISA results, which stands for "Program for International Student Assessment". In PISA, 15-year olds are tested for basic abilities in various fields. The 2006 round focused primarily on science learning. A little more than 60 countries participated, including Azerbaijan. Georgia and Armenia did not take part. So here's something that we are a little puzzled about. The Economist is undertaking a poll to see which American Presidential candidate is favored by the world. In a very blue worldwide map, rooting for Obama, two noticeable yellowish spots, Macedonia and Georgia. McCain, of course, is popular in Georgia for having said "Today we all are Georgians" during the recent conflict. World Public Opinion is the initiative of the Program on International Policy Attitudes (PIPA) of the University of Maryland that explores public opinion on a variety of topics in 25 countries across the globe, including Azerbaijan, the only South Caucasus country represented in the survey. Russia and Ukraine are the other two former USSR countries that the project includes. Indices are engaging and instructive, but some really baffle us. The World Economic Forum (WEF), the organisation that organises the annual high-profile Davos meetings, has come up with a gender index, and the Caucasus is featured. The index is intended to measure how the world is closing the gender gap in education, health, and political and economic participation. In principle, this is a great idea, since there are significant challenges and discrepancies (as our data itself shows). If you didn’t have time or are just too far away to attend a lecture at CRRC Azerbaijan, you can now get information about our past events from our main website. We have written previously about the World Public Opinion project of the Program on International Policy Attitudes at the University of Maryland. The project has recently released interesting data on energy issues based on the poll conducted in 21 countries. According to the WorldPublicOpinion.org publication, the majority of Azerbaijanis favor alternative energy development. 64% (compared to 77% average of 21 world countries) think that solar and wind power should be promoted more strongly in the country. Increasing the energy efficiency of buildings is also favored, while opinions split on the expansion of coal/oil-fired and nuclear power plants.